There's a lot more to Mama June's weight-loss journey than what meets the eye. For more than a year, fans of Mama June: From Not to Hot have witnessed the reality star's transformation from a size 18 to a size 4 figure. But as a new season of her WEtv series kicks off this Friday, the entire family has been reminded that the journey doesn't happen overnight. "I think that mama thought being skinny would solve all of her problems because she'd be able to do a lot more because she's smaller," Alanah "Honey Boo Boo" Thompson shared with E! News. "She'll be able to fit into a lot more because she's smaller. She wouldn't get so much hate because she's smaller." But according to Mama June, it's been the opposite. "It's honestly been the opposite. I've had so many surgeries in my last six months that I've had to lay down. I haven't been able to go to the gym," she explained. "And yes, I do eat my junk food and yes I do eat my comfort food but am I wrong for that? Yes. Am I sorry? No because I'm actually fighting for my vision and that's No. 1 right now." During our interview, Mama June said that she's plateaued between 185 and 190 pounds and feels "okay." She doesn't, however, ever want to go over 200 pounds. "Gaining 25 pounds to me is nothing. I want to lose 15 pounds," she explained. "I know I never want to go to 450 pounds, but honestly at 165, I felt like I was too skinny. I felt like I was losing weight too fast." Mama June added, "I'm happy with where I'm at because this has been an emotional and physical toll on my body and it's not an easy road to go through. I promise you." Ultimately, the new season of Mama June: From Not to Hot won't be all about weight loss. Fans may get to see Honey Boo Boo return to the pageant world. And yes, we will get to see more of Mama June's boyfriend. 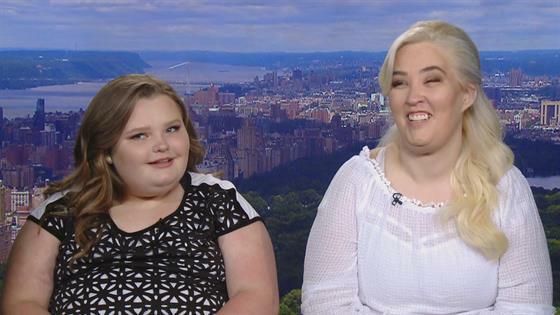 "I think Gino is a great man for mama," Honey Boo Boo shared with plenty of enthusiasm. "As you can see, she keeps a smile on her face all the time, which I love." Mama June: From Not to Hot airs Friday night at 9 p.m. on WEtv.